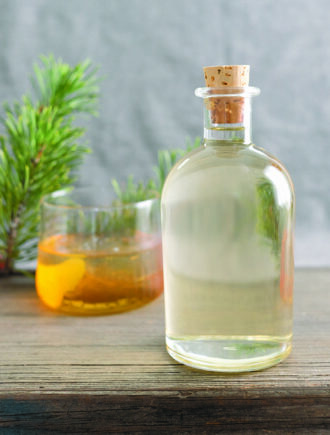 Homemade pine syrup can lend a smack of fresh, herbaceous flavor to all sorts of winter cocktails. 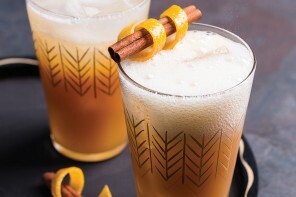 Try it in a Rye and Pine Old Fashioned. Place the conifer in a heat-proof ceramic or glass container. Pour boiling water over and cover. Let steep for at least 30 minutes and up to 24 hours. Strain through a fine-mesh strainer into a saucepan; discard the solids. Add the sugar. Bring to a simmer over medium-low heat, stirring to dissolve the sugar. Simmer for another minute. Remove from the heat and let cool. Store in the refrigerator for up to 1 month. Recipe reprinted from Emily Han’s Wild Cocktails and Drinks with permission from Fair Winds Press, copyright 2015. 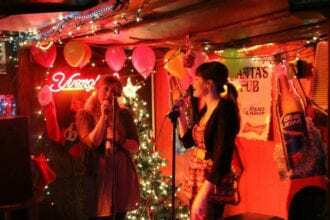 Everyone’s a star at Santa’s Pub in Nashville.